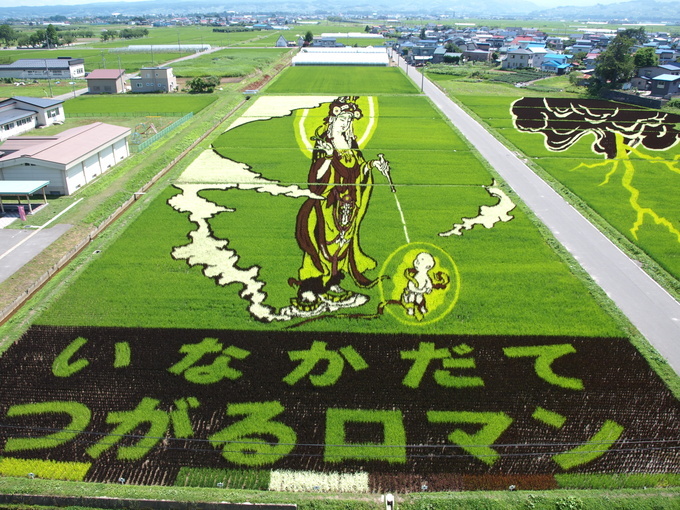 It's rice art festival season in Japan again. Holy hell, how do they do this? Every summer, at this time of the year, a quarter million tourists take scenic trains to gaze at the rice art festival in Aomori, Northern Honshu. The tradition started in Inakadate, a village of 8,000 hoping to revitalize its town in the early 90's. Hundreds of volunteers rope off patches of paddies, and plant different-colored rice strains. In fall, they harvest around the farm art too. Sometimes they're used as advertising. Is that a Facebook "Like" I see? This one urges you to shove "Tsugaru Roman" rice into your mouth-hole. Most of them depict Japanese folklore. Some of them draw from J-Pop culture. The cat from Night on the Galactic Railway. "Do your best, North East!" Good job, Japan. This is hecka neat.